Dogs do kiss, you know. A doggie kiss is that schlup-schlup-schlup flappy tongued salutation, usually performed mid-canine grin as a doggie greets someone. Here, that’s usually other doggies. We do not kiss dogs round here. The very thought causes shudders. Macaulay the dog is not choosy about what passes his lips. Or rather he is, but he chooses all the wrongest things. Once, when Felix was a very little boy of about three years old, he consented to a kiss from Macaulay. It was one of those moments that happens in slow motion. I still remember Felix’s happy grin, because he loves Macaulay and a slurpy greeting seemed to him like a good idea at the time. He and the dog occupied about the same head height in those days- maybe Felix was a little taller. We were putting on our coats and wellies ready to trek out with Macaulay in the porch which is a tiny space. The dog loves it: It means walks, coming back from walks, school bags with packed lunches inside, postmen, passing dogs to bark at and finally, the place where the lead is put on. Macaulay takes one look at the lead and demonstrates the chasm in cognitive development between humans and terriers. Because anyone with any sense would realise that lead is a link between himself and the forest. All one has to do, to get that lead on, is to sit down quietly and still so it can be attached. It is but a trice until the road is crossed and it comes off and forest freedom is his. But the dog makes it as difficult as any creature could to put this small, simple contraption on. He is beside himself with doggy joy. He is in a tiny porch with lovely smells and lots of wellies and Outside next door through the glass. And so he spins in small, tight, rapid circles of elation. Thus putting the lead on is a daily test of quick wits and lightning fast motor skills. It would make an excellent Olympic sport, chasing a terrier’s collar round and round and round ad infinitum. I think at least three of us were in that tiny space with the dog that day. and once I had finally caught the nickel ring which helps me to secure the lead to the dog I looked on with horror as the dog grinned happily at Felix, and then reached out and gave him a big, wet lickfest. Felix was delighted. He gurgled with laughter. The two of them regarded reach other, pleased compatriots in height above sea level. I did that slow motion No thing, and hurled myself in their general direction to prevent a connection. But my reflexes are slow and the deed was done. A wash later I was explaining to Felix why we never kiss dogs, and why we never let them kiss us. And a day later, the rash appeared. Unsightly? The sores were out of this world. It looked as though I had been feeding him chocolate, crisps and not a green vegetable for the last three years. It was enough to make anyone call out social services. We repaired to the doctors and it took a stiff course of antibiotics and a good week to get rid of The Dog’s Kiss. I recoil from the whole idea of a kiss from a dog. Yeurgh. But a hug? Oh, we do lots of that. Hugs are common currency in the Shrewsday household. The dog, despite his pungent aura, is a regular recipient, as is the cat. And the humans are champion huggers: group hugs, individual hugs, celebratory hugs, commiserating hugs; hugs for no particular reason. Unlike Macaulay’s Kiss, they really do seem to make us feel better. I think it’s because of a neuromodulator in the brain called oxytocin. Oxytocin is the bonding hormone. I always see it as a very small superhero complete with flowing cape. This little string of proteins can make us feel less anxious, more content. It increases trust, it seems, by outrageous amounts; and generosity abounds. It might also increase the ability to read social signals and it has been suggested it might be useful in helping those with autism as a result. A key player during the physiological processes of childbirth, it modulates inflammation. And so, almost unbelievably, there is evidence that oxytocin can make wounds heal faster. And every time you hug someone, oxytocin is released. Indeed, with those you hug regularly the little hormone is released just by looking at ta familiar huggable person. So while kissing the dog is off the menu, hugging peeps has just shot up my list of priorities. There’s a huge raft of scientific evidence to underpin its superpowers. Written in response to Side View’s Weekend theme: A hug or a kiss. Posted in Macaulay The Dog storiesTagged dogs, hugs, kissing, neurology, neuromodulators, oxytcinBookmark the permalink. Thanks, Linda 🙂 Hope all is well with you…must be right in the middle of Autumn there? Quite 😀 Thanks for the theme Sidey. Being British I blanched when I first saw it! Hugs are the business. One network I volunteer with are warm huggy types. Another network (the one where I refuse to go to meetings any more) are formal, competetive and worried about position. Guess which is the more effective group? Thanks Fiona 🙂 Interesting to hear about those two groups…yes, the theme: just saw it and fell in love . It doesn’t fit properly though. Going to have to lose a few pounds. Being a hugger myself, I love to give and get them. OMG! Ewww . . . poo!!! Your brother (and mother) probably don’t want you spreading that story around the internet, Andra. But I’m glad you did. It’s the first time I’ve laughed all day! I feel tons better as a result. The band around my heart seems to have loosened . . . just a bit. Thanks! And thanks to you too, Kate. I knew about the power of hugs and oxytocin but hadn’t applied it to our current situation. I shall hug Tigger at every opportunity to heal him . . . and me. Ah! 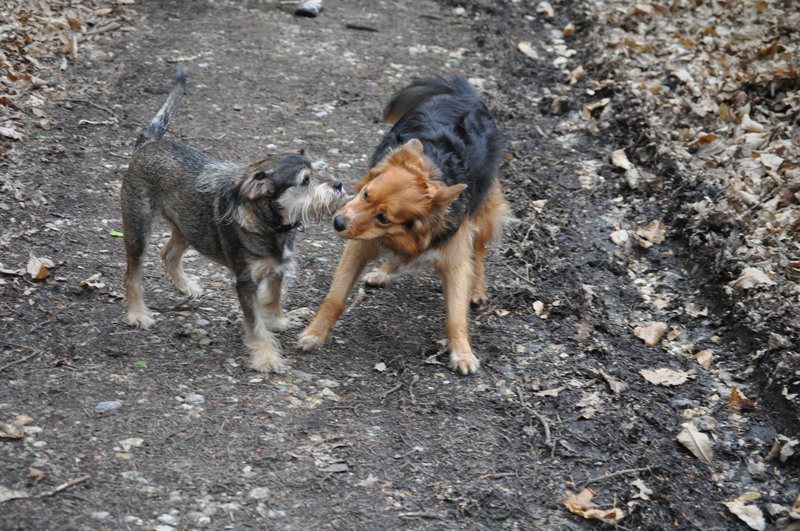 deadly dog kiss…. and yes hugs make you feel better instantly.. thank God for this expression of comfort…. Poor young Felix, tough lesson to learn at such a young age. I never used to be a hugger, but, as I have gotten to know so many folks in Rotary that I only see every so often, a big hug is always in order. It helps the body’s immune system; cures depression, reduces stress. It induces sleep; it’s invigorating; it’s rejuvenating. It has no unpleasant side effects. Hugging is all-natural, organic, naturally sweet and 100% wholesome. It contains no pesticides, no preservatives and no artificial ingredients. There are no moveable parts, no batteries to wear out. No periodic check-ups, no insurance requirements and no monthly payments. Let’s hear it for hugs!! (I am not, however, opposed to kissing my fur babies; but usually only on the tops of their heads! :)) And, by the way, happy Mother’s Day to you! Karen . . . that is LOVELY. Thanks for sharing. You’ve summed up our pug in 21 words. And I, too, love my oxytocin in hug form. Dogs, people. Love it. if my dog goes for my mouth, I field the kiss on my ear! I love hugs… That is strange that the dog’s kisses created a rash?? I’m going to have to abstain from my dog’s kisses in the future.. Does hugging my dog accomplish the same thing? I rarely have a human around to hug. No doggy kisses, though. She’s very restrained in how she shows affection — rather like her owner, I’m afraid. Oh, that is just silly. It is extremely rare for a human’s skin to react with a rash from very brief contact with a dog’s tongue. All my little babies (all whom I’ve raised from very young pups) automatically move to lick my cheek if I kiss their foreheads. I don’t discourage it, who can resist such loving, pleading eyes that appear heartbroken if I turn away from such a small lick? None of my four-legged, furry children have ever been excessive lickers, one or two quick licks after they receive a peck on the forehead and they stop. No one in my family, myself, nor anyone I have ever known has experienced an allergic reaction from this. Dogs trust you and love you with all their hearts, in many cases they become permanently imprinted on you if you are their primary caregiver. They most certainly do have the ability to feel emotion (including emotional pain) and if their most treasured companion refuses their instinctual form of affection, it can sadden them. I personally would not want to hurt my sweethearts’ feelings like that. Two, maybe three face washes a day will do to combat bacteria, even though statistically and scientifically dogs’ mouths are cleaner than our own.